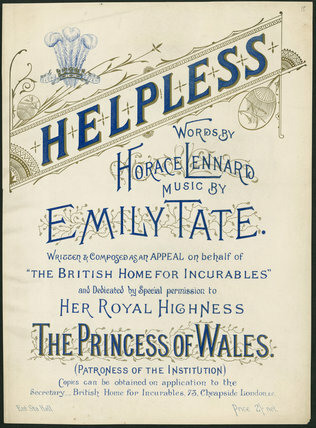 Helpless', music cover, United Kingdom, 19th-20th century. Music cover with medical theme, by Horance Lennard and Emily Tate. Written and composed as an appeal on behalf of 'The British Home for Incurables'. England, 1863-1925. When a Man's a Little Bit Poorly', sheet music, United Kingdom, c.1855. All Through Obliging A Lady', sheet music cover, London, England, 1882. Valse de L'Hopital', sheet music cover, by E.Carpentier de Selvier. Exeter, England, 1800s. Model of adenovirus, England, c.1976. The Munitions Girls' oil painting, England, 1918.